Flax oil is the only concentrated vegetarian source of the important omega-3 fatty acid, alpha-linolenic acid (ALA). Omega 3 fatty acids such as ALA compete with the more abundant omega-6 fatty acids in western diets, helping to normalize production of prostaglandin E2 and leukotrienes series 4. ALA is recognized as an important contributor to cardiovascular health. FlaxCaps is stored under refrigeration and shipped with a cold-pack to assure freshness. FlaxCaps contains pure, organically grown, cold-pressed, virgin flaxseed oil which has been processed in the absence of light and oxygen, and nitrogen-packed to preserve freshness. 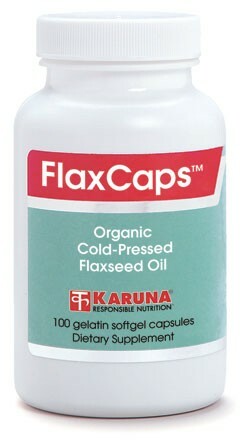 FlaxCaps is stored under refrigeration in Karuna's warehouse and shipped with a cold-pack to avoid damage to this oil's fragile fatty acid bonds and the resultant formation of lipid peroxides, a measure of rancidity. 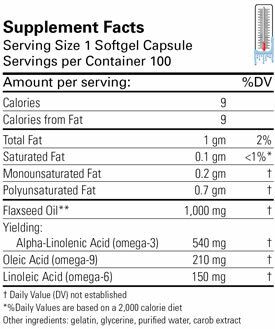 Suggested use for adults: 1-6 softgel capsules, 1-3 times daily, best taken with meals, or as directed.